Depends on workload and the season. A time frame can be discussed on quoting your job. I own and run New Life Home Decorating Ltd. I am also on the tools which I enjoy. I have been painting for 34 years and started my apprenticeship in Gore. I joined Master Painters Association about 12 years ago. I believe in doing the job once and doing it right. My number plate endorses this! I don't cut corners and my handshake and word is my bond. I use Wattyl, Dulux an Resene products. I employ one other tradesman whom I have trained and also have a female apprentice. If you live out of town and need to rely on someone with experience and honesty, I am your man. I cannot speak highly enough of Chris and his team. Chris is honest and has integrity in his approach to his work and to helping people achieved their desired result. He was so kind in helping me put furniture back after painting the bedrooms and hallway as my husband was away. Thank you Chris for helping me and fitting me in when I know you are so busy and having everything finished to surprise my husband when he arrived home. What an amazing difference and feeling you have made to our home. So refreshing to meet an honest tradesman. Given that we do not live locally, from the detailed quote to the end result we couldn’t fault Chris and his team. Kept us informed all the way through & workmanship was high quality. Would not hesitate to use Chris again & highly recommend to others. I can guarantee you won’t be disappointed. We are very happy with the great work done by Chris and his team. Work included interior paint touch-ups to full wall and ceiling repaints, as well as stripping, staining and using sikkens products to exterior woodwork. It's nice working with a hands on professional and friendly painter. I have no hesitation recommending Chris, and will certainly use him again. Chris did a fantastic job getting our house painted before winter. He kept us fully informed of progress and any other issues he encountered along the way. He certainly engendered trust and confidence through his professionalism and it gave us much peace of mind given we are not living nearby. Lisa and I are both very grateful and we will most definitely use him again in the future. We've been using Chris’s services for 5 yrs now and wouldn’t want to use anyone else. The quality of his workmanship and the service provided is excellent. He's always responsive to any work request and it is to his credit that he is happy to do small jobs as well as big ones. If having someone in your home can be stressful then I would highly recommend Chris as not only is he a pleasure to have around he is completely trustworthy and we're very happy to leave him in our home whilst away. I found Chris to be true to his advertisement in the yellow pages. He is trustworthy and always puts the customer first. His standard of work is excellent and his manner is kind and very approachable. He has made an excellent job of my laundry, kitchen and living room walls and I would recommend him to others. I found Chris in the Yellow Pages. From the first call to organise a quote for a complete paint of the interior of a three bedroom home to the finish of the job, Chris was always prompt. He gave a detailed quote, which was appreciated. The workmanship was of an excellent standard, and the work was completed in a timely manner. Where appropriate Chris would make suggestions and offer advice which was most helpful. I am more than happy to recommend him and his crew. 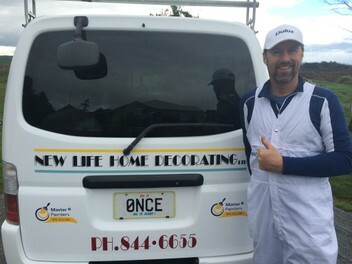 Needed a job completed once husband had done his best with it, scrolled through Trade me for help came across Chris, after reading reviews i thought this is the man for our job, Chris is a very punctual, reliable professional person, he completed our job with ease & no concerns from me, i would happily call Chris again for our next project. It is great to see such professionalism and a can do attitude these days. Chris is an extremely good tradesman, neat and tidy and his work is of a very high quality I would recommend him highly to all. Having read the other reviews I have to agree with everything that they say. We have just had Chris and his team in to paint the interior of our home and we are absolutely thrilled to bits with it. He is totally true to his motto "Do it Once, Do it Right" From our fist meeting with Chris we knew that we had the right man for the job. He is honest, helpful and supportive during the whole process. We would highly recommend that you to call him if you need any painting or decorating done. WOW!! I called on Chris to help out with a home decorating project on the strength of previous endorsements. My lucky day! He's a great guy and really professional. He gave me a fair and honest quote and did an amazing job (despite being really busy)in record time. My home looks fantastic. Thanks Chris, you're the best. It is refreshing to have professional trades people that are reliable, trustworthy, competitive and deliver a high quality outcome. An additional bonus is you can give them access to your home whilst you are absent, and still feel at ease. Fabulous team and highly recommended. From the first time we employed Chris fifteen years ago we have absolutely professional and enjoyable dealings with him and Alex. Chris has painted our challenging house twice and has re-papered and painted almost all the rooms (cathedral and flat ceilings) His ability to manage for us and work with other trades to achieve a quality product is acknowledged. We were happy to give Chris the keys to our home so work could be done while we holidayed. He and Alex are honest and very trustworthy. Great work and probably the most friendly polite professional man I have met in a long time. Place looks really great! Chris has been painting our windows and doors internally and externally. Chris's work ethic is professional and friendly with a high level of Integrity. The service provided has been clean, fast, accurate with excellent results. I have no problem recommending Chris to my family and friends. We have worked with Chris on several home renovation projects and can highly recommend him. He gives expert advice, looks at all possible approaches to a job, and only uses quality materials. When you work with Chris you know you will do the job once and it will be done right! Chris and his apprentice painted the interior of our house. We were delighted with the result. He has an eye for detail, is very careful and works hard. He completed our job without nipping off to other jobs and was always polite and easy to communicate with. He is honest, has integrity and stuck to his word. I would have no hesitation in recommending him to my friends.